Friday May 9th 1879 Hatt is 22 years old today. We did a big days sewing were not interrupted at all. I had an invitation to Lizzie McKinstrys wedding and a letter from Miranda Anderson. 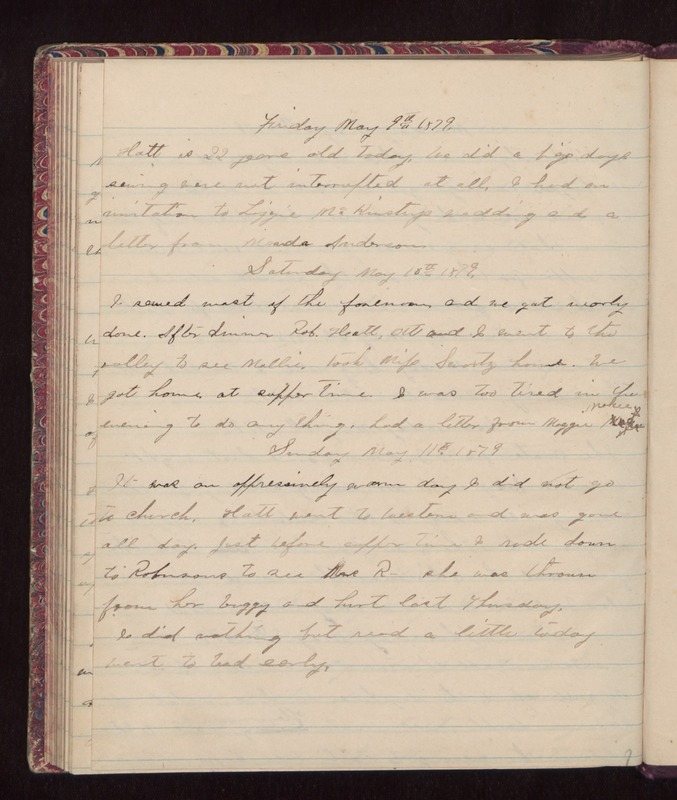 Saturday May 10th 1879 I sewed most of the forenoon and we got nearly done. After dinner Rob, Hatt, Ott and I went to the valley to see Mollie. Took Miss Swartz home. We got home at supper time. I was too tired in the evening to do anything. Had a letter from Maggie McKee. Sunday May 11th 1879 It was an oppressively warm day I did not go to church. Hatt went to Westens and was gone all day. Just before supper time I rode down to Robinsons to see R- She was thrown from her buggy and hurt last Thursday. I did nothing but read a little today went to bed early.